Well, now I have another late blog post. I just thought that Tuesday's downpour was intense. On Wednesday evening we had a storm of prodigious proportions. Everyone is safe and sound, however. The good news is that the chance of rain has now dropped to 10 percent for the rest of the week. It appeared that the complaint about food was heard loud and clear because he had a great deal more food for breakfast on Wednesday. The Dining Hall Director appeared at the daily scout leaders' meeting to talk about how the food is proportioned. She explained that a catering company is under contract by the council to develop the menus, cooking instructions, and the serving size. The amount of food served is based on the standard serving size from the nutritional label on the food package. It was pointed out to the director that she wasn't feeding school kids, she was feeding teenage boys who were engaged in heavy physical activity in the summer heat. The standard serving size was not really adequate. I will also note that based on the size of some of the scout leaders at camp, it would seem the standard serving size needs to be tripled or quadrupled for them. Although, the goal is to avoid food wastage, the director promised to make second helpings available more quickly so that everyone can get enough food when they want it. A "standard serving size" breakfast. The boys have been heavily engaged in their merit badge classes. Boone and Louie have created several interesting objects in their metalworking merit badge and Paul has begun weaving an artistic pattern into a stool seat. Several of the boys are working on arrows for the archery merit badges and a few have created some, mostly indescribable, woodcarving projects. The adults have been busy as well. 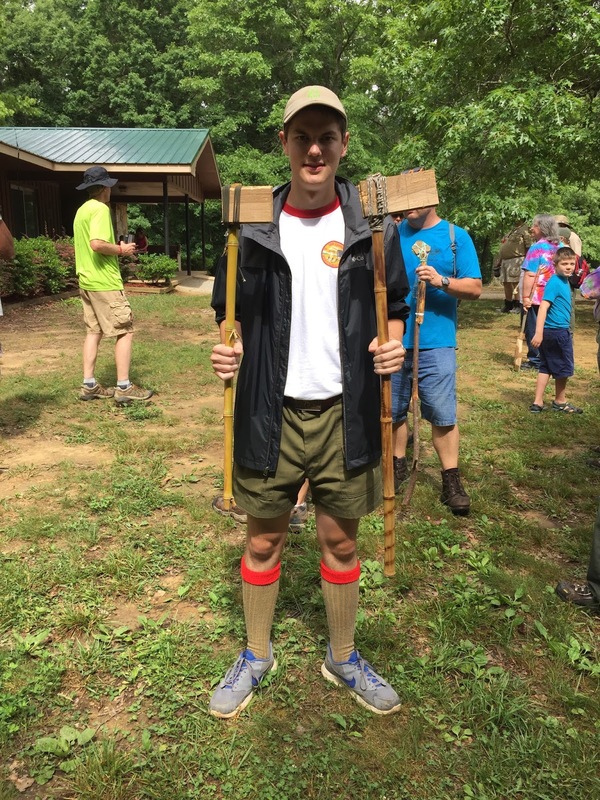 Our youngest assistant scoutmaster, Davis Baird, entered the leaders' golf tournament yesterday morning. This involved building his own clubs from natural materials. With the help of Clay, two clubs were created using bamboo poles, and a 1x4 piece of lumber. These were lashed together with a piece of paracord. The tournament had the largest group of leaders that had ever participated, with a total of eighteen golfers. Davis appeared to have some fierce competition, although some of the other leaders joked that as a future Air Force officer he was obligated to play golf. Due to the large number of golfers they only played three holes. This involved hitting the "ball" (a whiffle ball) with the homemade club and attempting to bounce the ball off of various trees on the way to the "hole" (hollowed out tree stumps). Based on the shouts, groans, laughter, and applause that echoed across the area, it appeared that they had a lot of fun. The game was scored by the camp commissioner using different criteria than regular golf. Although Davis thinks that he did well, we won't know who "won" until it is announced at the closing campfire. Davis tees off on number one. The afternoon passed peacefully (literally the lull before the storm). 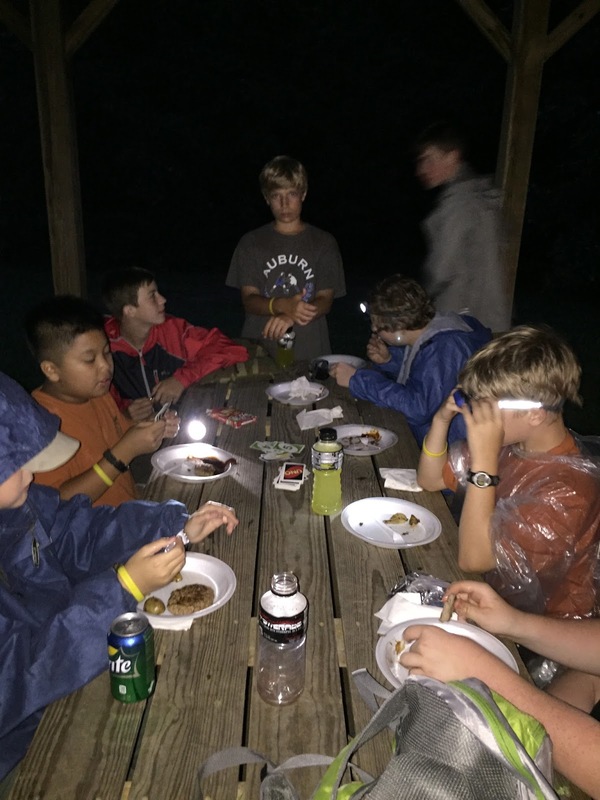 Wednesday evenings at Skymont are designated for troop cooking in the campsites. The scouts are provided ground beef, potatoes, carrots, onions, aluminum foil, and charcoal to make hobo meals. By 5:30, the boys were eager to build fires in their patrol sites for making their meals. However, the darkening sky and a quick look at a weather app told us to begin preparations for securing the campsite. We got the tents secured and food packed up in the trailer before the storm hit with a vengeance. The leaders quickly herded the boys to a program pavilion next to our campsite to get under cover. The wind began to pick up and lightening began to cross the sky. The camp's emergency siren began sounding to summon everyone to the dinning hall but we decided it was safer in the pavilion that in putting the boys out on the road to the dining hall in a lightning storm. The camp director later came by in a vehicle to check on us and affirmed that we had made the correct decision. The safety of the boys is always our first concern. Some of the boys were spooked by the storm at first but a couple of decks of cards were produced and soon they were heavily engaged in various games. Our young ASM started dealing blackjack to one group who began to think they were playing for real money in Vegas. Their shouts and groans soon overtook the sounds of the storm. The storm was forgotten once the cards came out. Mr. Herrit fries up veggies on the griddle. As the storm began to subside, we still needed to cook dinner. Our fire pits were now small ponds and it seemed unlikely we would find dry wood or be able to fire up our charcoal on wet ground. Instead we hauled our big stove and the food up to the pavilion. The ground beef was used to cook hamburger patties on the griddle and the potatoes were cut up for frying alongside the beef. 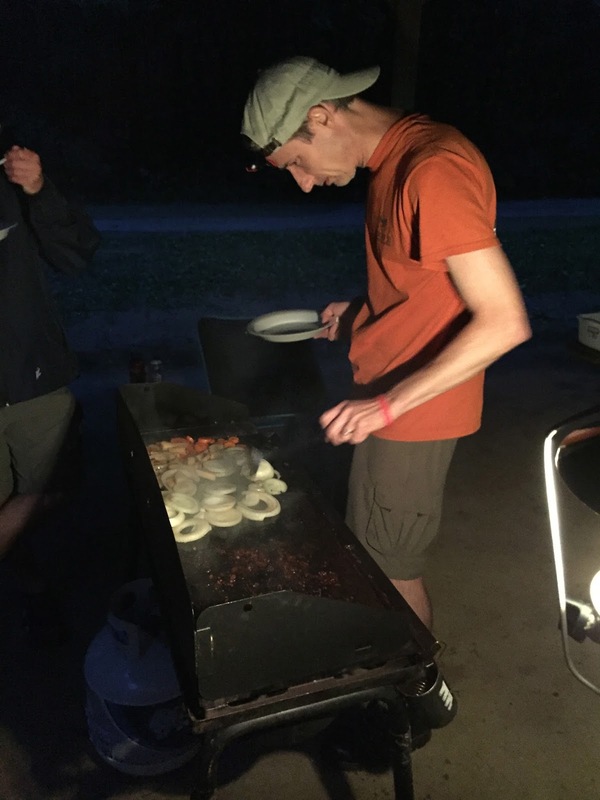 We served everything right off the griddle so the scouts had a hot and hardy meal. By the time we finished cleaning up and making a few announcements about the following day, it was about time for bed. The tents and gear once again survived intact but the Mountaineers' dining fly collapsed for the second time in as many days. We also missed the vespers service at the chapel due to our late dinner but our chaplain's aide, Aiden, attended to serve in the service. The rest of the week looks good for both food and the weather. I will keep you advised. If you were not aware, more photos are found here.